District Supervisor, New York, New York. Please return the attached clipping with a report as to any evidence, outside his own statements, that this man was a marihuana smoker. Yesterday, September 3rd, 1941, I interviewed Assistant United States Attorney Richard J. Burke at his office in the Federal Courthouse, Foley Square, New York city, concerning the above named individual who is being held here on a charge of murder on the high seas off Rio de Janeiro, Brazil, at about 6 AM on the American freighter Malamton of the Marine Transport Company line. 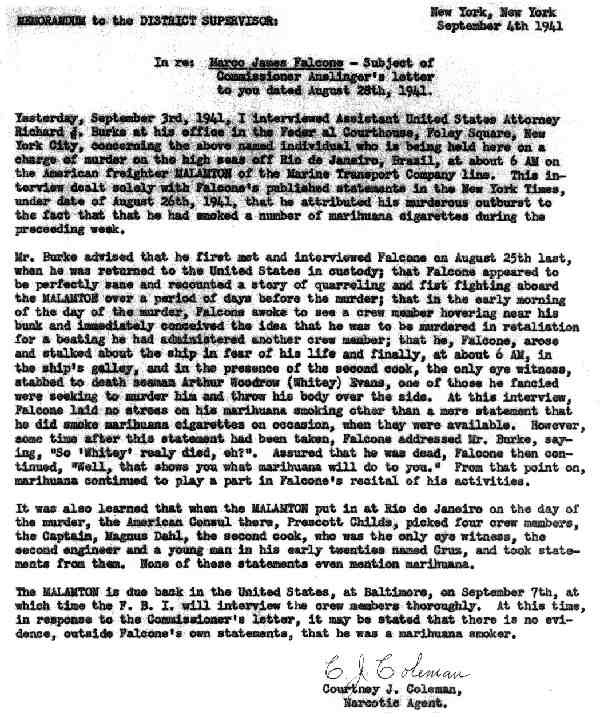 This interview dealt solely with Falcone’s published statements in the New York Times, under date of August 26th, 1941, that he attributed his murderous outburst to the fact that that he had smoked a number of marihuana cigarettes during the proceeding week. Mr. Burke advised that he first not and interviewed Falcone on August 25th last, when he was returned to the United States in custody; that Falcone appeared to be perfectly sane and recounted a story of quarreling and fist fighting aboard the Malamton over a period of days before the murder; that in the early morning of the day of the murder, Falcone awoke to see a crew member hovering near his bunk and immediately conceived the idea that he was to be murdered in retaliation for a beating he had administered another crew member; that he, Falcone, arose and stalked about the ship in fear of his life and finally, at about 6 AM, in the ship’s gallery, and in the presence of the second cook, the only eye witness, stabbed to death seaman Arthur Woodrow (Whitey) Evans, one of those he fancied were seeking to murder him and throw his body over the side. 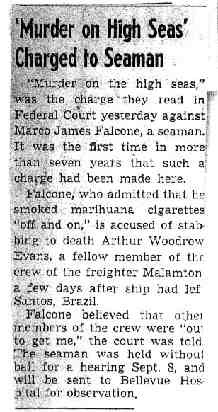 At this interview, Falcone laid no stress on his marihuana smoking other than a mere statement that he did smoke marihuana cigarettes on occasion, when they were available. However some time after this statement had been taken, Falcons addressed Mr. Burke, saying, “So ‘Whitey’ realy died, ah?” Assured that he was dead, Falcone then continued, “Well, that shows you what marihuana will do to you.” From that point on, marihuana continued to play a part in Falcone’s recital of his activities. It was also learned that when the Malanton put at Rio de Janeiro on the day of the murder, the American Consul there, Prescott Childs, picked four crew members, the Captain, Magnus Dahl, second cook, who was the only eye witness, the second engineer and a young man in his early twenties named Cruz, and took statements from them. None of these statements even mention marihuana. The MALAXTON is due back the United States, at Baltimore, on September 7th, at which time the F. B.I. will interview the crew members thoroughly. 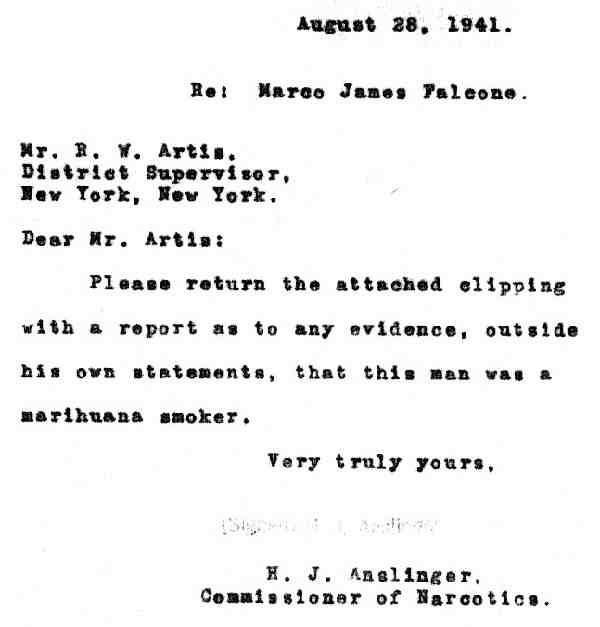 At this times in response to the Commissioner’s letter, it may be stated that there is no evidence, outside Falcone’s own statements, that he was a marihuana smoker. In re: MARCO JAMES FALCONE. 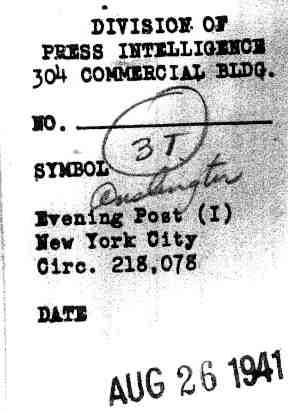 Reference is made to letter dated August 23, 1941, relative to the above, mentioned subject and attached photostat of an item appearing in the New York Times of August 28, 1942. There is attached hereto a report of this matter submitted by Narcotic Agent Courtney J. Coleman, which is self-explanatory. 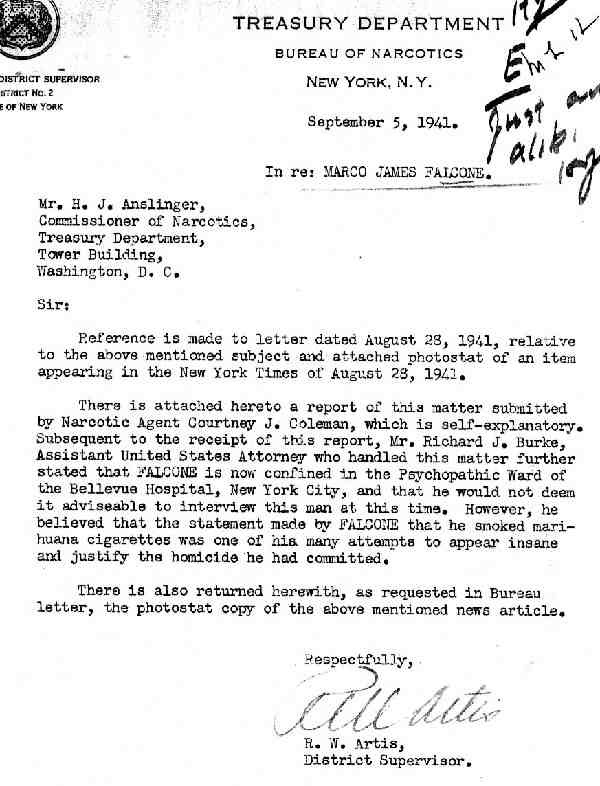 Subsequent to the receipt of this report, Mr. Richard J. Burke, Assistant United States Attorney who handled this matter further stated that FALCONE is now confined in the Psychopathic Ward of the Bellevue Hospital, New York City, and that he would not deem it adviseable to interview this man at this time. However, he believed that the statement made by FALCONE that he smoked marihuana cigarettes was one of his many attempts to appear insane and justify the homicide he had committed. There is also returned herewith, as requested in Bureau letter, the photostat copy of the above mentioned news article.